This Light Award is sponsored by 365 Forward Steps and processed through Kiva.org. Abilyn is 42 years old and married with four children. She lives in a rural community outside of Honiara, the capital of the Solomon Islands. 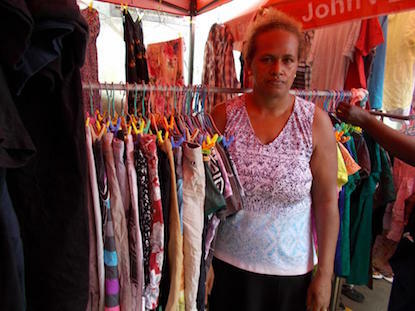 Abilyn runs and operates a small secondhand clothing business, selling items such as ladies blouses and shirts, skirts and trousers, and kid and adult wear in her community and the market to earn a living. She has been doing this for four years. With her previous loans, she was able to start up her business and pay for her children's school fees. With the ongoing help of SPBD staff on how to run a business, her business is running smoothly, and she is making an income. Abilyn is now requesting a new loan to start up a general store apart from her existing business. She needs the loan to buy general food items such as rice, flour, biscuits, noodles, canned goods and snacks to assist her with her new business. She plans to use her profits to build a new home for her family. She joined SPBD in 2013 to gain access to financial services. Congratulations to Abilyn in the Solomon Islands..!